Hannah Swegarden is one of 18 graduate students to receive the 2016 Future Leaders in Science Award from the American Society of Agronomy (ASA), Crop Science Society of America (CSSA) and Soil Science Society of America (SSSA). The award recognizes her interest and engagement in science advocacy. Winners receive a trip to Washington, D.C., March 14 to participate in the annual ASA, CSSA, and SSSA Congressional Visits Day, where they will meet with their members of Congress and advocate for agricultural and environmental research. 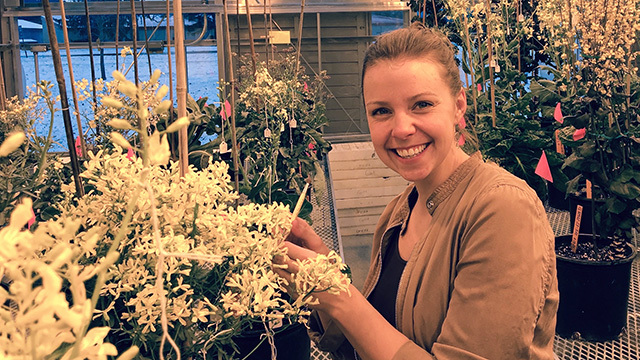 Swegarden is a first-year Ph.D. student in the Graduate Field of Horticulture in the School of Integrative Plant Science (SIPS) at Cornell University. Her current research focuses on the development of novel Brassica genotypes for fresh and processed markets, under the direction of Phillip Griffiths. She received her B.S. in Biology (2010) from the University of Wisconsin – Eau Claire and her M.S. in Horticulture (2015) from the University of Minnesota.